The area in and around Horseshoe Bend, Idaho was originally settled in the 1860s as a gold miners’ staging area— a place where prospectors waited for snows to thaw at the higher elevations so they could work their claims. After the gold rush, the city became a prosperous ranching and logging community. In these early days, the dirt roads could not handle all the traffic and freight, so an entrepreneur named Colonel W. Dewey formed a railroad syndicate in 1897 to meet these varied transportation needs (the railroad was completed in 1914). Today, instead of serving miners and hauling cattle, sheep and timber, the Thunder Mountain Line’s Horseshoe Bend Route is for the pleasure of tourists and railroad buffs. It’s especially refreshing on a hot summer day as you ride the rails through the cool Boise National Forest. Whether you buy a ticket for the luxury parlor car or choose a standard class fare, the covered open-air car is the best spot for taking photos of the pretty scenery and for enjoying the mountain air. Depending on your route and destination, you are not only likely to see deer and other wildlife, but also kayakers and whitewater rafters having a great time on the scenic Payette River. Be on the lookout for Rainbow Bridge— built in 1933, it is the shortest solid rock tunnel in North America (37 feet). 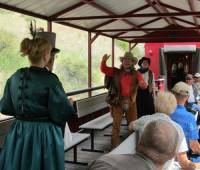 In addition to food, drinks, and a narrated history lesson, many of the train trips offer Wild West Shows complete with a train robbery and a shoot-out! Other rides include karaoke or mystery theatre themes. If the Thunder Mountain Line seems familiar, you might have seen it on public television. A few years ago, it appeared on “Great Scenic Railway Journeys” an Emmy-award winning series that profiled some of the world’s most historic and scenic tourist railways. Horseshoe Bend is located in southwest Idaho, about 28 miles north of Boise. Large gravel parking area at the train depot can accommodate all sizes of RVs. I would like to know prices and when you will offering rides for 2018.